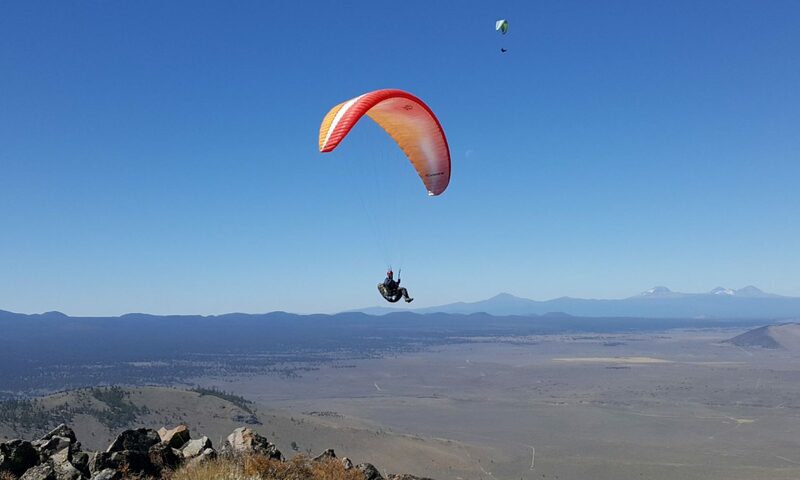 The Desert Air Riders is a small and active paragliding club based in beautiful Central Oregon. Paragliding started in this area in the late 1980’s, and the club was formed in the early 1990’s. We fly year-round, although the best paragliding weather is in late spring, summer, and early fall. Desert Air Riders Membership: To join the club see the Membership page for instructions. Club members can renew their membership in the Desert Air Riders using the convenient online renewal page. You can learn more about the club on the About page. Central Oregon Flying Sites: There are five flying sites less than an hour drive from Bend, the largest city in Central Oregon. Most of the flying happens at Pine Mountain, which has launches in almost all directions. Pine Ridge is the second most popular flying site during the summer, and Black Butte, Grizzly, and Haystack are flown much less frequently. Pine Mountain Fly-in: The Desert Air Riders have hosted the annual Pine Mountain Fly-In every year since 1991. Pilots and their families camp at the mountain for the weekend, fly during the days, and get together for dinner at the Flying Farm on Saturday evening. For information about the event visit the Fly-in page.